Overall success: Depends on how you look at it. Well, it’s been a long while. The last few weeks have been completely hectic – all that life brings as well as a bonkers trip from London to Madrid in a rickety classic car, followed by a spectacularly foody time in glorious San Sebastian. Finally I got myself in gear, made some free time one Sunday and set to work. After a fair amount of research and reading about the very particular nature of Cornish pasties (side seals, top seals, carrots, no carrots, simple filling, complicated fillings), I took the easy route and decided to follow a simple recipe from my favourite new cookery book. Incidentally it’s a book introduced to me by Dave and one that I think The Jim is very pleased about. It is ‘The Prawn Cocktail Years’ by Simon Hopkinson and Lindsey Bareham. It is a hub of nostalgic recipes which were once so fashionable – chicken kiev, crème caramel, prawn cocktail along with a host of other dishes I remember as a child. 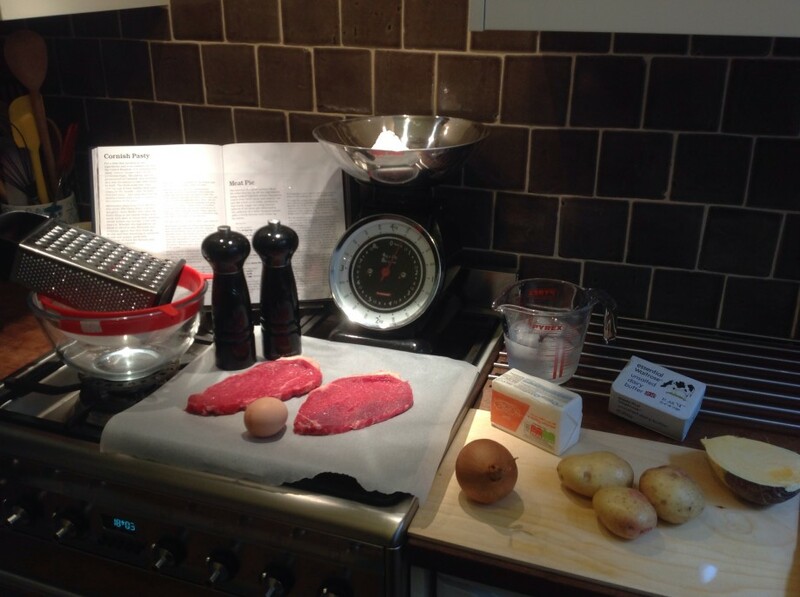 This is also a book that Dave is cooking his way through in spectacular fashion – read his blog! 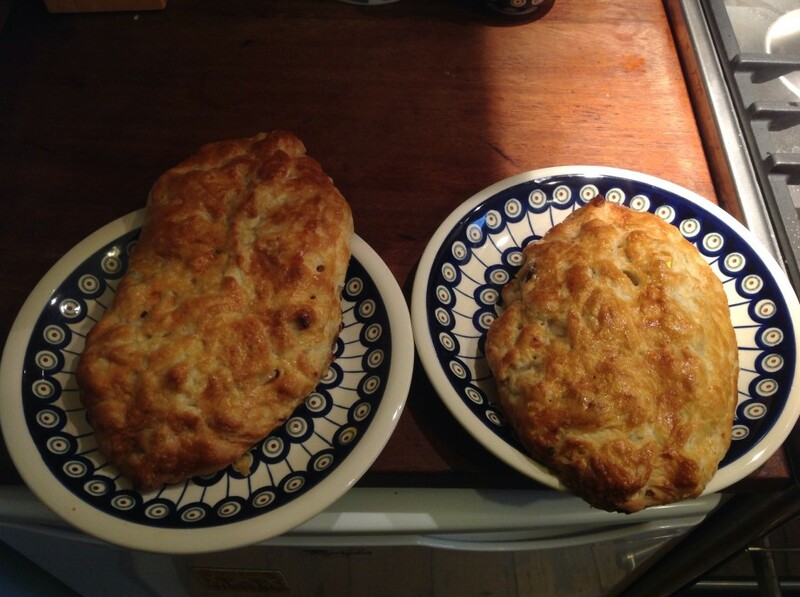 I halved all the ingredients to make two pasties. So here it goes. Pop the lard in its wrapper in the freezer for a good couple of hours. When you’re nearly ready to go, fill a jug with cold water and add some ice cubes whilst you’re preparing the other bits and bobs. Then, sift the flour and salt into a mixing bowl. 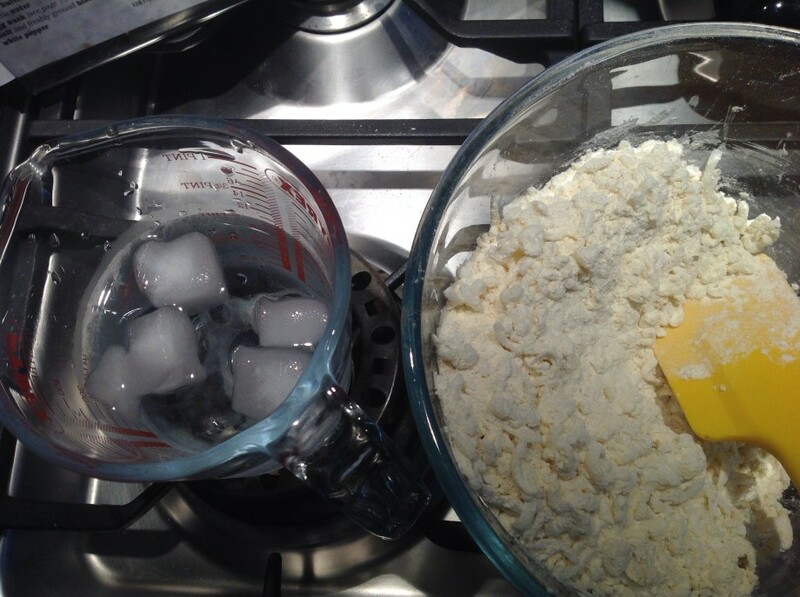 Take the lard out of the freezer and with a coarse grater, dipping the lard into the flour whenever the grater gets clogged (you’ll see what I mean if you try it), grate the lard into the bowl. Once it’s all in, mix everything together and it’ll look like a bit of a mess. Then, to bring it all together, adding a tablespoon of the iced water at a time stir it all together until it forms a ball. 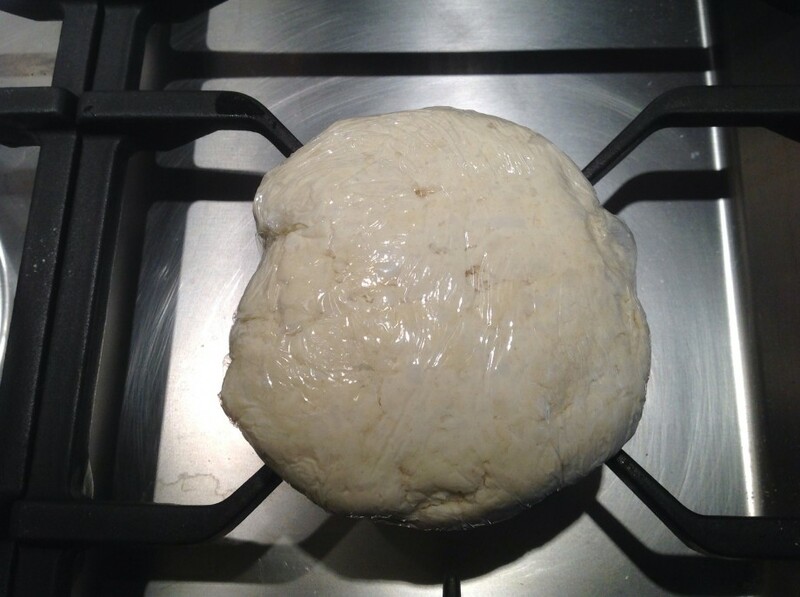 The dough I made seemed rather sticky, and I think I might have made an error which manifested itself later… gather all the dough into a ball and turn it out onto a piece of clingfilm, wrap it up and shove it in the fridge to chill for 30 minutes or so. Preheat the oven to 200 degrees centigrade. 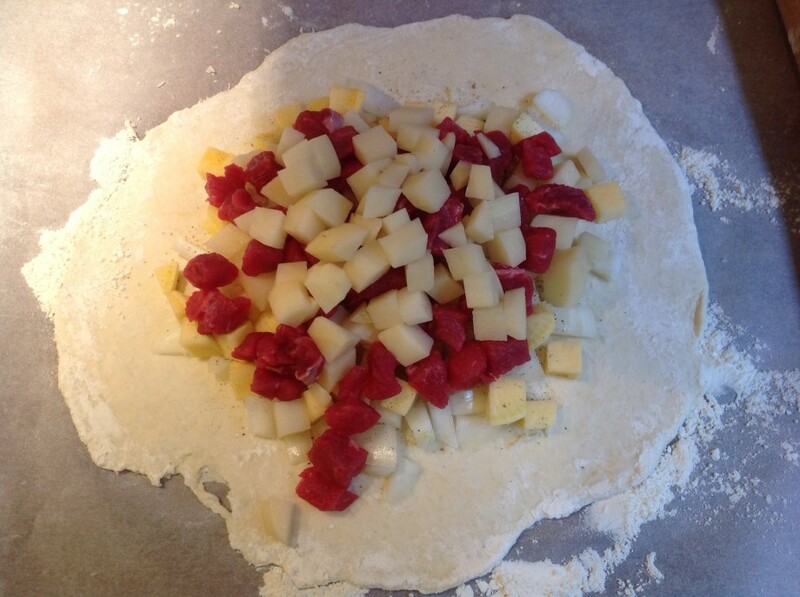 Whilst the dough is chilling, prepare the filling – get peeling, chopping, dicing and dividing. I had separate piles of ingredients so I could evenly divide them when filling the pasty. Time to take the pastry out, and here was where I realised I had fluffed up on the pastry, it was too sticky and too stretchy – perhaps not enough flour, perhaps too much water so it was pretty irritating to do. 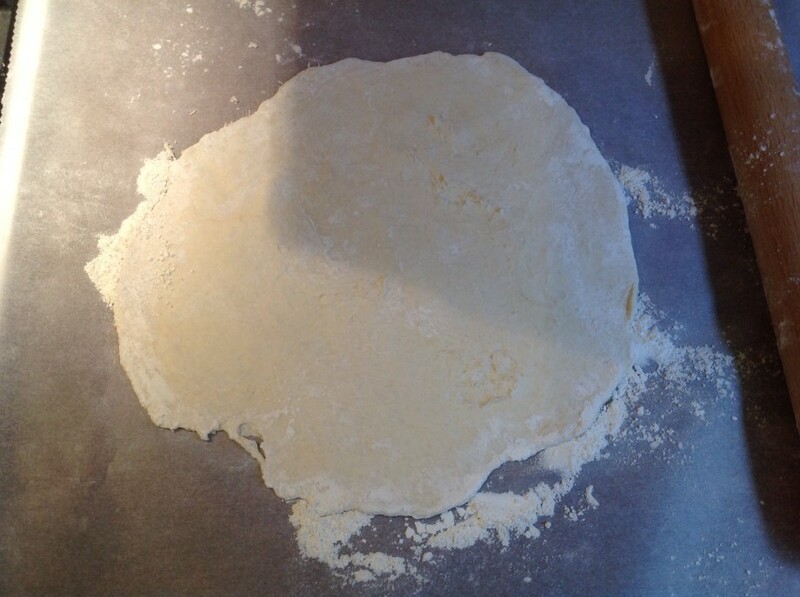 I ended putting a handful of flour on top of a sheet of non stick baking parchment to be able to roll the pastry at all. 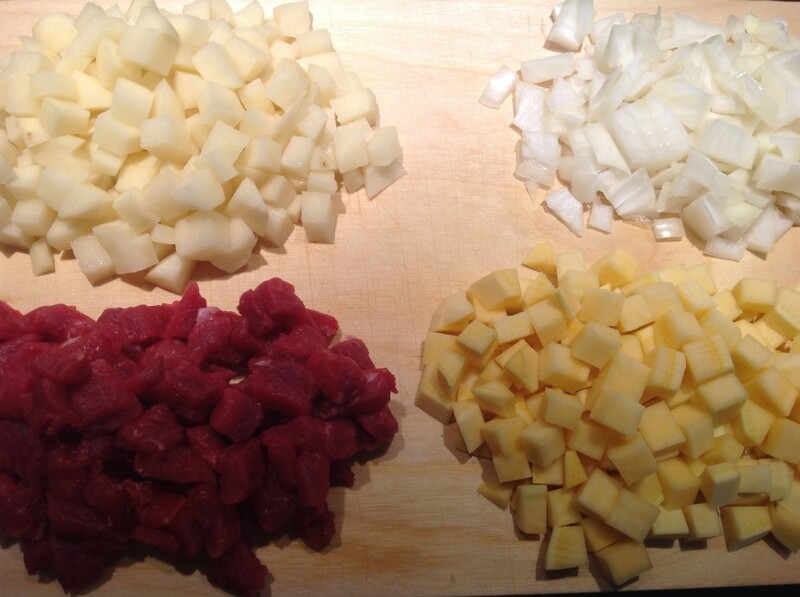 After I had created some kind of area for the filling to go, I layered the filling up: first onion and swede across the centre in an oval shape leaving a 2cm border all the way round, season, then meat and half the potato, season and the rest of the potato. Here’s where it got silly. I was meant to moisten half of the border with a little water then ‘bring up each side of the circle to enclose the filling, and press together to form a ridge’. I was meant to be able to ‘crimp the pastry to form what looks like a stegosaurus’. This did not happen. Instead I ended up with a holey, heaped mess of white gloop with bits of filling straining the thin pastry to escape. 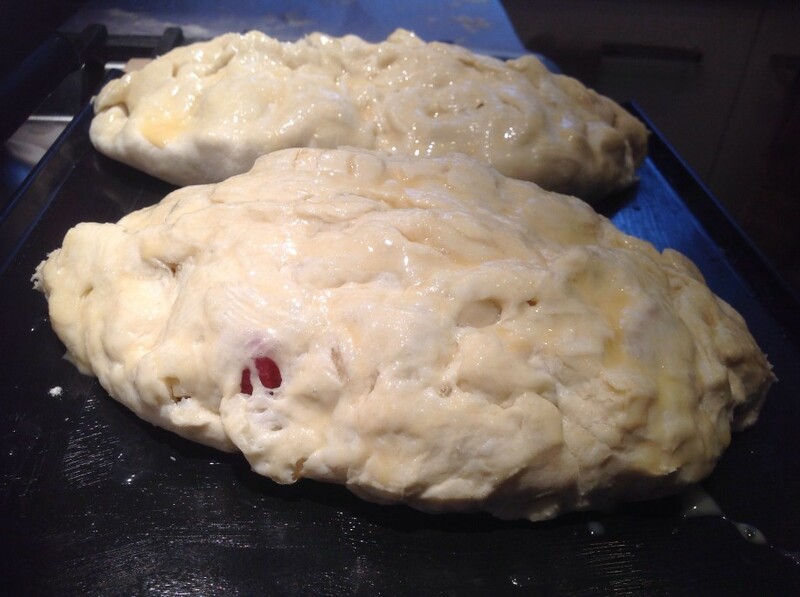 I ignored it, painted on the egg wash to these ‘pasties’, and popped them in the oven to bake. 15 minutes on the preheated temperature, before turning it down to 150 for a further 40 minutes. Well, what came out of the oven resembled more of a giant, slipper but it did smell of pasty, and it was crispy. The Jim and I sat down to eat it (it was so massive they didn’t really fit on plates), and because of the weak pastry we had to use knife and fork but it was very tasty. Crispy pastry, delicious filling, perfectly cooked, soft beef, well seasoned which we happily munched through whilst enjoying the spoils of our Spanish holiday – a very delicious red wine. All in all a success, perhaps not as a pasty, but certainly as a tasty dinner (mine fed me for lunch the following day too). Somebody else finished his. Finally, my challenge was to make a traditional Cornish pasty followed by another pasty of my choice. Well, I have done the first bit, but not the second. Dave – please can I skip part two? I am ready to start afresh please. p.s. I STILL haven’t tried the kimchi. They look great! Trust me, I’ve made much worse looking pasties in my time. The trick is not to overstuff them. 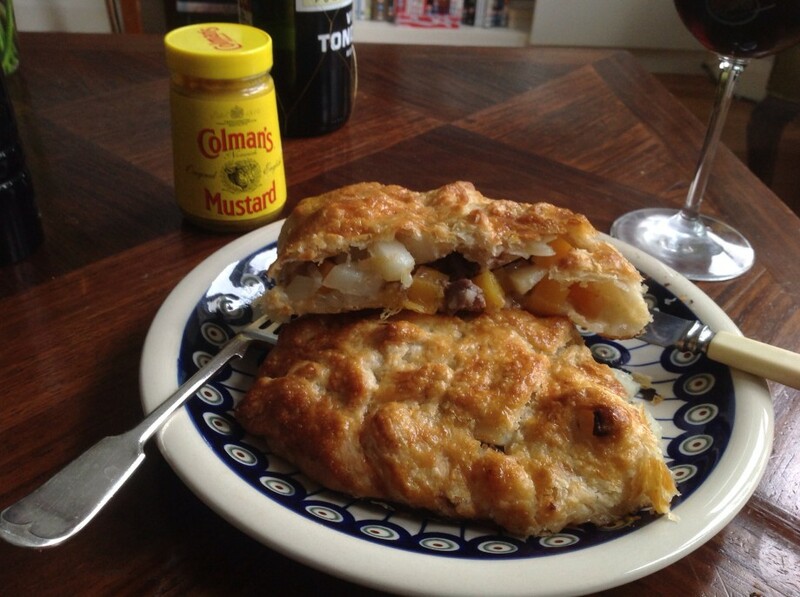 I’ve never come across a recipe that didn’t overestimate how much filling you could fit inside the pasty. 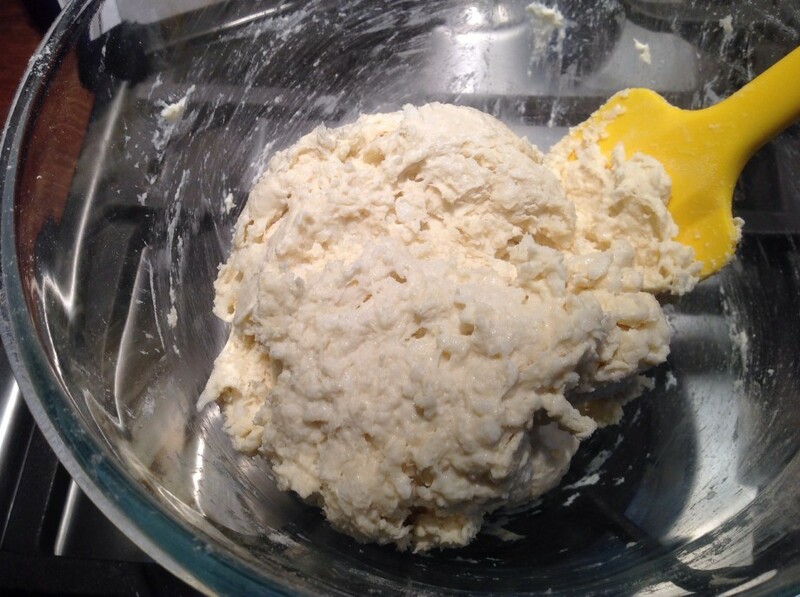 Restraint is needed – if you overfill, the pastry will tear and instead of a pasty, you’ll have a meat and veg filled doily. And yes, your pastry was too wet. A little extra flour would have fixed that. I’m very pleased you finally got around to making the pasties, and I shall certainly allow you to skip the second part of your challenge – on one condition. You *must* try the kimchi.